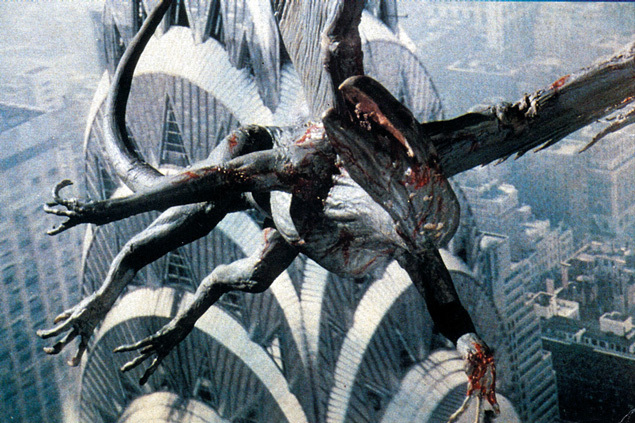 One sequence from Q: The Winged Serpent perfectly encapsulates the appeal of Larry Cohen’s first-rate Z-grade schlock: The audience is aware at this point that the Aztec god/monster Quetzalcoatl has been terrorizing the roofs of New York City, taking up residence in the famed art-deco spire of the Chrysler Building. A construction worker on a skyscraper looks around for his missing lunch pail, raging about how people keep stealing his food, and how he isn’t going to stand for it anymore. Sure enough, when he climbs a ladder to the very top of the building, there’s the empty lunch pail; the presumed culprit is the supernatural creature, which swoops down and carries off the worker seconds later. Nope. Cohen cuts to a couple of the victim’s co-workers, enthusing over their purloined tuna sandwich. That’s the Cohen touch: He’s great with humor and misdirection, and he doesn’t mind planting an offbeat one-liner or visual joke to break the tension. Given his budgetary restrictions, he knew up front that his off-brand version of a New York monster movie couldn’t possibly compete with the gargantuan likes of Dino De Laurentiis’ 1976 version of King Kong, so he found cheaper and smarter ways to entertain. And when the monster does appear, the effects have a homemade, Ray Harryhausen-like appeal that entirely suits the film’s carefree, improvisatory spirit. This is a movie that devotes much of its second act to its Runyon-esque hero trying to bilk the city out of $1 million for information leading to Quetzalcoatl, the “winged serpent” that’s conspicuously picking off city denizens. 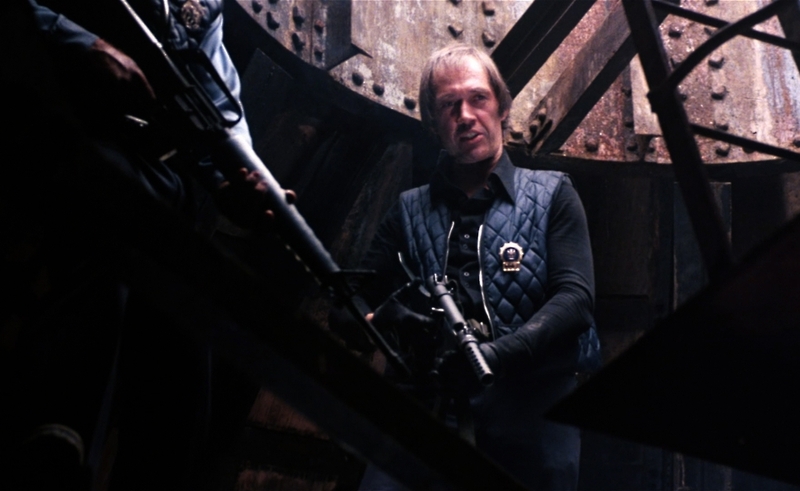 But the main attraction of Q is a gangly beast named Michael Moriarty, whose unexpected line readings and gestures knock the film pleasantly off balance. Moriarty stars as Jimmy Quinn, a two-bit wheelman who would happily forfeit his life of crime and settle down with his live-in girlfriend (Candy Clark) if he could find work as a jazz pianist. (Cohen discovered Moriarty had a passion for jazz piano, and simply worked that aspiration into the script. That’s how he operates.) After a diamond heist goes south, Jimmy dashes into the Chrysler Building and works his way up to the spire, where he discovers a giant nest containing a giant egg. Meanwhile, two detectives, Dr. Shepard (David Carradine) and Sgt. Powell (Richard Roundtree) look into a series of horrific serial murders connected to an Aztec cult. It takes a while for them to figure out Q and the Aztec cult are related, but once they do, city officials want Jimmy to give up the nest’s location. A more selfless hero would want to do everything possible to save the city; Jimmy is the sort of hero who wants a million bucks first—and a picture with Rupert Murdoch’s arm around him, if that can be arranged. Cohen gives Q the Jaws treatment for as long as possible, showing a shadow here and a neck there, but holding off on the whole creature until later. This limitation gives him plenty of opportunities for clever staging, like a death from above revealed through a sprinkle of blood rain on the people below, and wry dark comedy, like when Shepard shrugs off the question “Did you find the guy’s head yet?” with a nonchalant “It’ll turn up.” When Cohen finally relents and shows Q flapping around in all its glory, he doesn’t try to hide the effects to make them seem slicker than they are; all the attacks take place during the day, and while Q won’t give anyone nightmares, there’s a throwback charm to it that honors Japanese monster movies more authentically than an expensive Hollywood production ever could. The rough-around-the-edges quality of Q—and all other Cohen movies, for that matter—is occasionally just rough. Despite a mountain of exposition on Aztec lore from a shifty-eyed museum curator, there isn’t much follow-through on the Aztec-cult subplot, and the film generally goes flat whenever Moriarty or the monster aren’t nearby to salvage it. (One exception: A cop who’s serving undercover as a mime, which is pretty much the opposite of incognito.) But Cohen wisely leans on Moriarty to carry Q through the wheel-spinning between action setpieces, and Moriarty, in turn, so dominates every scene that even Carradine, an actor with no shortage of charisma himself, turns into a giggling spectator. Quetzalcoatl is only the film’s second-mightiest force of nature. There’s a trailer that gives away too much and a teaser that gives away too little, but a typically superb Larry Cohen commentary track gives away just the right amount of trivia, production details, and Moriarty appreciation. Cohen recalls a disastrous first screening, arranged by B-movie producer Samuel Arkoff, in which audiences came expecting Steven Spielberg’s follow-up to Close Encounters, and fled the theater in droves once Arkoff’s name appeared in the opening credits. He also boasts about the amazing feat of putting the production together in 48 hours after he was fired from the set of I, The Jury, and reveals his method of improvising lines and scenes on the fly, often by shouting new lines from behind the camera. Moriarty excelled under those conditions—they made five movies together—and would actually have Cohen send the other actors home so his close-ups could be filmed without them. He could play their parts in his head.